This year Durga Pooja/Puja begins on 26th September and ends on 30th September. On these days the Goddess Durga is worshipped with much reverence. Durga Pooja is mainly celebrated in West Bengal, Assam, Bihar, Meghalaya, Manipur and Jharkhand. Months of preparation culminates into these days of Pooja. Pandals are built and idols are made. During this period people also prepare art and cultural programs. Lavish poojas, scrumptious bhog are very much a part of the celebrations. Ma Durga is a Goddess that was born from the divine powers of the 3 main Gods Brahma, Vishnu and Shiv. She took birth mainly to defeat the evil half man half buffalo demon Mahishasura. Because of the boon granted to him by Brahma, no man or deity could kill him. He became evil and started killing men and waged a war against the Devas. Durga Ma appeared on Earth to defeat him. Ma Durga has 10 hands and each hand is a representation of her power. It is with these 10 powers or shakti that she killed Mahishasura. Vijayadashami marks the victory of Ma Durga over Mahishasura. In other parts of India Vijayadashami is the victory of Lord Rama over the demon Ravana. Basically, in both cases its the victory of Good or Evil. It is said that during these days of festivity, food stalls are set up near the pandals for people to enjoy festival food with family and friends. Chops, khichuri, biryani, chowmein, chapta chana, radhabhallavi, cholar dal, luchi, aloo dum are some of the most popular dishes served. However no Durga Pooja festival is complete with some delicious Bengali sweets. Jilipi, Sitabhog, roshogollas,mishti doi, sandesh rasmalai, just to name a few. I’d till now not tried making sandesh. Its not that I’ve not come across enough recipes of sandesh from fellow bloggers. So when Durga Puja was decided as the 111th theme for #FoodieMonday #Bloghop I wanted to make a paneer based sweet or mithai so that I could even include it the Protein Rich Dishes for the Mega Blogging Marathon. To make the sandesh a bit different I thought of pairing up the baklava flavor to make this flavorful sandesh. The main flavors of a baklava besides the crunchy phyllo pastry are walnuts, pisachios, almonds mixed with spices like cardamom, cinnamon and cloves with honey and orange blossom water. The end result was a baklava flavored sandesh without the crunch. Again I’m pairing up two events i.e. FoodieMonday and Mega Blogging Marathon. For this recipe I must thank Sujata of Batter up with Sujata whose guidance was of utmost importance and to Srivalli of Spicing your Life with her endless pictures of how to knead the paneer or chenna to make it smooth and more smooth. By the way please visit Srivalli’s blog where she has made 21 (and a few still coming up) Bengali sweets all using paneer for the Protein Rich Dishes theme. Take a colander and line it with a thin cotton or muslin cloth. Place the colander on a big bowl or saucepan. Heat 1 litre of milk till it becomes hot. Add lemon juice and slowly stir the milk till it begins to curdle. Pour the curdled mixture into the colander. With the help of a spoon, gather up the paneer into the middle. Wash this under running water for a few seconds to remove the lemon. Gather up the edges of the cloth and squeeze out extra water. I like to place a heavy stone on the cloth covered paneer to remove excess water. The paneer should be soft and not hard. Knead the paneer in a tray or a plate for 5-10 minutes till it is really smooth. Transfer the mixture to a wide non stick pan. Place the pan over low to medium heat and cook the paneer stirring it all the time. After 5-6 minutes, the water will evaporate and the mixture will leave the sides of the pan and form a dough. Add the coarse nuts powder, cardamom, cinnamon, clove powders and the orange blossom water.Let the mixture cool down. Knead this mixture again till it becomes really smooth. Take about a tablespoon of the mixture and roll it between your palms into a ball. The mixture should not stick to your hands at all. Shape into a disc like shape and make a dent on top. Repeat steps 17-18 till all the mixture is over. Gently heat honey in a small pan over low heat. As soon as you see tiny bubbles appearing at the edges, take the pan off the heat. Add the chopped nuts, spices and orange blossom water. Mix well. Top each sandesh with the topping. Cool the sandesh in the fridge and offer to Ma Durga. The amount of paneer you get from 1 litre can vary on the milk. If you have a bit of leftover paneer, use it as a dip or as a sandwich spread. 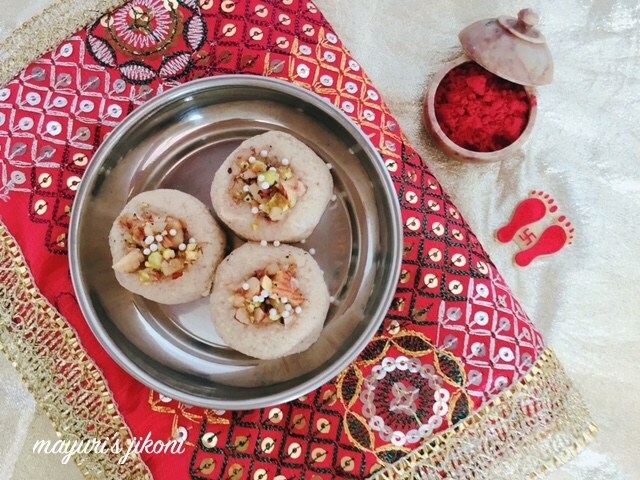 I loved the idea of using honey and nuts to jazz up the taste quotient of the Sandesh! So innovative Mayuri..　…looks delicious! I love the idea of making fusion sandesh with baklava. I love both of them individually and combination must have been amazing. Healthy share Di..have to try sandesh with honey. That is a nice flavour addition to sandesh. It is one of my fav sweets and I am drooling over the snaps.. This is a fantastic sandesh flavour…hahah..endless kneading is what it was!..and I must try this sometime..I guess you can simply with fresh chhana to make so many different flavours!..thanks for the mention.. Simply love baklava .. Baklava flavored sandesh is a very nice variation..
Sandesh looks yummy Mayuri. Adding honey and orange blossom is very innovative. This Sandesh sounds very exotic , bookmarking right away , looks like a perfectly presented sweet for the upcoming festival . That's a very innovative spin on the classic sandesh. Yours and Valli's posts are tempting me to try this asap! Wow this is delicious and yum. I like the idea of honey and nuts. Between Valli and you I think I will be dipping my toes in the pool that is Bengali sweets soon. Omg, you think out of the box Mayuri, even in my dream i would have never thought of making sandesh in baklava flavor, you rock yaar. Baklava flavoured Sandesh sounds interesting. Love your innovative idea ! !Love the bhog during festivals. Baklava flavoured sandesh is very inviting. Nice innovative idea.